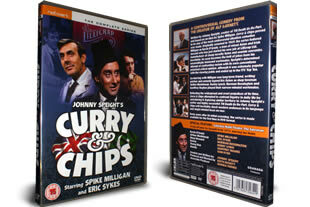 Curry And Chips DVD set. The complete series. DELIVERED FREE IN THE UK WHEN SPEND OVER £15. A controversial 1969 British sitcom.The ambition of Curry and Chips was to highlight immigration and racial discrimination. 1 DVD Set delivered to your door. Very good old time dvd. Funny and well done. Might have a bit of a time recreating the humor in today's world. Very good price.